Jean Joubin was born in 1661 in Saint-Benoit de Carmaux, in the district of Albi, in the diocese of Lavaur, in Languedoc, in the south of France. He was the son of Benigne Joubin and Jeanne Rivos. The Stuart king James II (1685-88) attempted a Catholic restoration which brought a severe resistance from the Anglican Church. The unexpected birth of an heir to the throne brought about the threat of a permanent Catholic dynasty for England. Peter I, the Great, (1672 – 1725) lived around the same time as Jean Joubin, Peter the Great established Russia as a major European power through a rapid program of Westernization. Peter fought major wars with the Ottoman empire, Persia, and in particular Sweden. After 1721 Russia supplanted Sweden as the major power in the Baltic. Peter failed to nominate a successor, and was succeeded by his wife, Catherine I. Artists of Jeans time were Johann Sebastion Bach, Antonio Vivaldi, George Frederick Handel, Voltaire, and Moliere. Advancements include Sir Isaac Newtons law of gravity, Gabriel Daniel Fahrenheit invented the mercury thermometer, and Thomas Newcomen produced the first effective steam engine in 1712. Beginning in the 16th Century, a pattern of famine crises in France was being caused by bad weather and war. It continued until the later part of the eighteenth century and raged over much of central and southern Europe. The 25 years ranging from 1690 to the death of Louis XIV was the dark side of the reign of the Sun King. Wars linking France to the Spanish Succession (1702-1714) came just after the bloody war of the League of Augsburg (1689-1697). But the military losses were insignificant compared to the impact of repeated crop failures caused by rainy summers and freezing winters. Malnourished peasants, when not literally dying of hunger, were prey to endemic diseases. These diseases would then turn into epidemics, such as the dreaded dysentery. Famine this year has put an end to over seventeen thousand families in your province and forced a third of the inhabitants, even in the good towns, to eat wild plants. When all grains stores were exhausted – wheat, rye, oats after wheat – the poor were reduced to collecting acorns and ferns to make a kind of bread. Nettles, walnut shells, cabbage stalks, grape seed do not have best effect. These “nasty weeds’’ completely ruined the health of the poor. The priests, also spoke of the animals. “No longer are they nourished and die before men: the carcasses of dogs, horses and punctured other animals are consumed despite their status of rot. “the people of Lorraine and other surrounding lands are reduced to such extremities that, like animals, they eat the grass in the meadows…and are black and thin as skeletons. Decades of temperamental seasons created massive instability. In addition, every spring, food stores were requisitioned for the needs of the army of Flanders while the rest is purchased in haste by speculators who bet on rising prices. By 1693, a one-pound loaf of bread cost a worker the equivalent of a days work. The darkest days were the years 1693-1694 when over 1.7 million French died from uncommonly cold winters, malnutrition and plague. 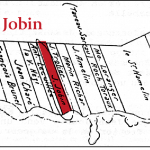 Jean Joubin’s name appears on a list of colonists prepared in 1690; he was the only Joubin in New France, and most likely the only one in his family to travel to the colony. Again, it is not clear his reasons for taking the dangerous trip across the Atlantic, but history can help determine some possibilities. Colonization of North America was a contest that France was losing. Even though the French had been in North America since 1608, there was only 3,000 colonists by 1660. In comparison, New England and the Chesapeake had 58,000 colonists. The new emigrants came primarily from northern and western seaports: Rouen, Nantes, Saint-Malo, La Rochelle, and Bordeaux. This is where merchant and crown recruiters could link poor and footloose young men with waiting ships. During the seventeenth century, fewer that 250 families emigrated to Canada and only 12 percent were female. In search of work and food these impovershed French men had moved to a port before some became sufficiently desperate to engage for service across the Atlantic. Most were urban laborers and artisans rather than rural peasants, which complicated their adjustment to a colony where most had to raise crops. Most of the female emigrants came from an orphanage in Paris and were know as filles du roi (daughters of the king). In addition to paying their passage, the crown provided a cash marriage dowry; alluring incentive for orphan girls lacking family money. They are everywhere. The will stay hidden behind a stump for ten days, existing on nother but a handful of corn, waiting to kill a man or a woman. It is the cruelest war in the world. They are not content to burn the houses, they also burn the prisoners they take, and give them death only after torturing them continually in the most cruel manner they can devise. Most of the French who did emigrate to Canada significantly improved their status and standard of living, escaping their former poverty as landless laborers. At least 80% of the colonists lived as habitants, leasing farms of about one hundred acres. Habitants took pride in their regular consumption of meat and white bread, which few French peasants could afford. 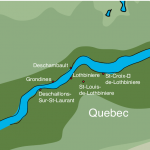 The seigneurie of Grondines is located on the north shore of the St. Lawrence river, upriver from Quebec City, between the seigneuries of Deschambault and de la Pérade. Its forests are rich in oak, evergreen, and maple trees. The river banks are low, making approach by boat easy; the harbour of Grondines is sheltered from the wind. 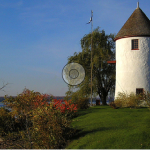 Starting in 1634, all along the St. Lawrence River, farms were designated according to the seigneurial system. This is where land grants called seigneuries were issued to anyone who could attract settlers. The Grondines seigneurie was granted to the Religious Hospitallers of the Hôtel Dieu; it was originally called Saint-Charles-des-Roches, but the inhabitants renamed it “Grondines” (from the verb “gronder”, meaning to rumble or roar). The significance of this name was explained by Gédéon de Catalogne in 1712, in a report he prepared about seigneuries. …The name comes from the many heaps of rocks facing the shore; whenever it is windy, the water pounds on them, making a great deal of noise, and it becomes very dangerous for canoes and boats. In 1671, the first concession was given to Timothée Josson; thirty more colonists settled that year. Among them were François Couillard, Hilaire Frapier, Pierre Tousignant, Antoine Leduc, Gilles Masson and Louis Hamelin. In 1674, the settlers asked the Religious Hospitallers to build them a mill. Master carpenter Pierre Mercereau of Quebec was hired to build it; when it was completed on September 13th, 1675, Gilles Masson was hired to run the mill and maintain the building which served as the seigneurial residence. Masson apparently neglected his duties, and he was fired on November 2nd, 1680. The property was a source of problems for the nuns, with little financial gain. On March 20th, 1683, they sold the seigneurie to Jacques Aubert and his wife Antoinette Meunier, for 3,000 pounds. Four years previously, on August 7th, 1679, the oldest Aubert daughter, Antoinette, then aged thirteen, had married Louis Hamelin. Jacques Aubert had promised his future son-in-law a dowry of 500 Tours pounds, of which 200 was to be paid on St.Michael’s day (September 29th), with the balance in cash or beavers during the two following years. On November 27th, 1685, Louis Hamelin’s brother François married Antoinette’s sister, Marie-Madeleine, with the same dowry arrangement. On March 27th, 1693, Jean Joubin was granted a concession in Saint-Charles-des-Roches of Grondines. No copy of this transaction has been found, but the inventory of his important papers made after his death confirms its existence. A copy was in the files of notary Charles Lesieur, but few of his files have survived. 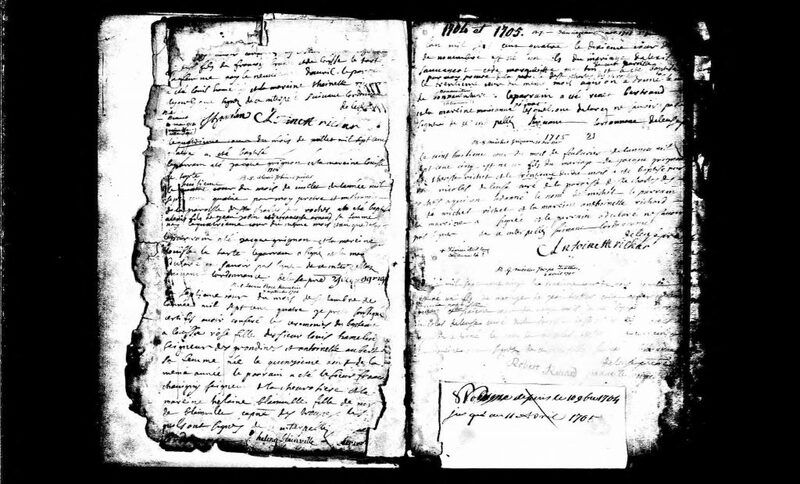 Jean Joubin, age 33 married Françoise-Élisabeth Renaud, on May 2nd, 1694, in the parish of Grondines. She was the daughter of Pierre-André Renaud dit (known as) Locat, from St-Martin de-Carcares, and Françoise Desportes from the district and diocese of Béziers, in Languedoc. The third child of 14, Françoise-Élisabeth was born January 17, 1675 in Sillery, Quebec. (Sillery is located within the city of present day Quebec City. In May, Jean and Françoise-Elisabeth were married, a month later, their first child was born. A daughter, named Françoise-Isabelle was born, but did not survive. On January 29th, 1696, a son arrived; they called him Jean-Baptiste. When another son, François, was born on May 10th, 1698, his godfather was seigneur François Hamelin, co-seigneur of Grondines, indicating that there were close ties between the two families. 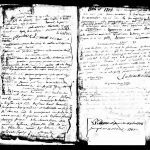 Apart from the baptismal records of their children, there are few notarial documents to give us details of the life of Jean Joubin dit Boisvert. 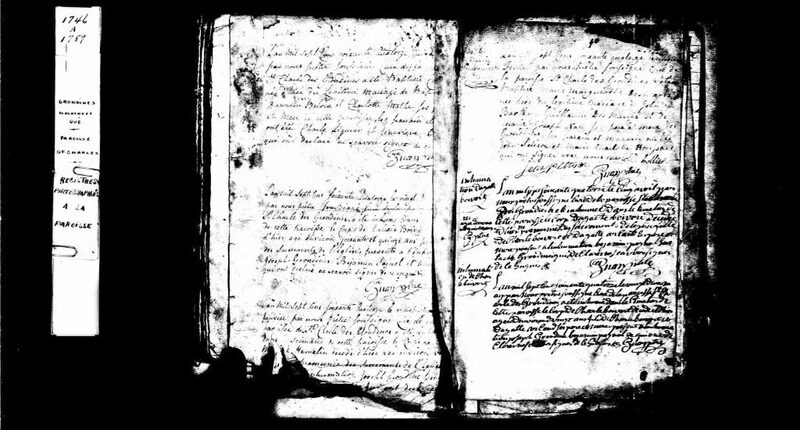 On June 11th, 1700, notary Michel Roy de Chatellerault recorded the sale by Jean Joubin of a two-arpent lot in the seigneurie of Saint-Charles-des-Roches Grondines to a fellow parishioner, Jean Trotier. In a 1709 document prepared by Gédéon de Catalogne it is recorded that Jean Joubin dit Boisvert occupied land between that of Jean Trotier and Antoine Lécuillé. The 1700 document confirmed that his land was separate from that of Trotier. Around 1702, another son was born, and baptized Joseph Jobin dit Boisvert. On July 8th, 1704, Alexis Joubin dit Boisvert was born, followed by three girls, Marie-Françoise on February 22nd, 1707, Marie-Josette on January 31st, 1710; and Françoise, on May 8th, 1713. The last son, Charles, was born on May 23rd, 1716. On April 12th, 1728, when Jean Joubin was sixty-seven, he and his wife Françoise appeared before notary François Trotain to make a living will in favour of their son Jean-Baptiste. Jean Joubin and his wife give to their oldest son Jean-Baptiste, living with them, a homestead two arpents wide by 40 deep, detached from another portion 4 arpents wide. 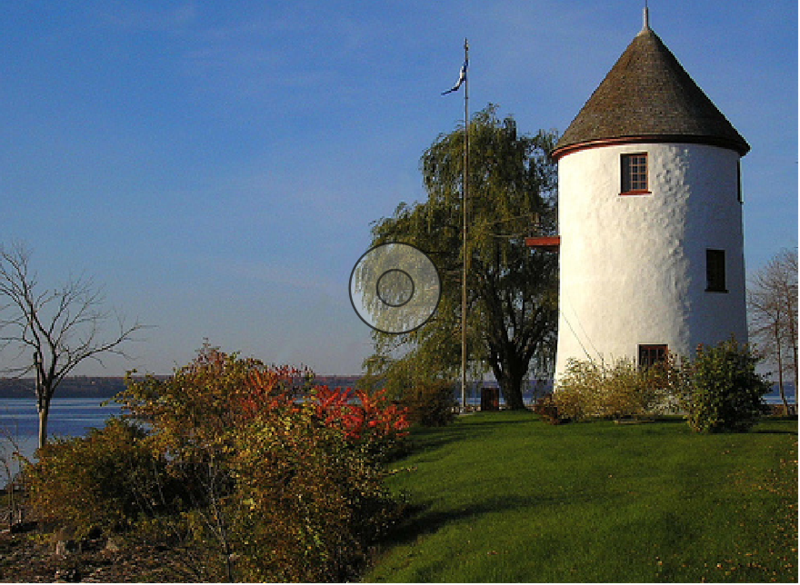 The land fronts on the St. Lawrence river, and on either side are the homestead of the widow of Jean Trotier, and the detached portion of their land. This gift was made on the condition that Jean-Baptiste look after his parents in their home, providing their upkeep, clothing and food. This gift was made in recognition of the good and loyal service their son has provided and continued to provide to his parents. He must also look after and feed his four brothers and sisters who have not yet reached the age of maturity. On September 8th, 1729, Marie-Françoise died, at the age of twenty-one. Joseph died on April 14th, 1734, aged thirty-two. He had married Marie-Josephte Lecuyer in 1729; this marriage became a source of confusion to later generations of Boisverts, who assumed that they were descendants of Jean Joubin, because of an involuntary error on the part of Monseigneur Cyprien Tanguay in the preparation of his dictionary of Quebec families. They entrusted themselves to the care of Alexis and his wife Charlotte Hamelin in return for two of the four arpents they still owned, and for half of all the buildings thereon, and half of their livestock, furniture and household articles. Alexis and Charlotte were to take care of them in their home, and feed and care for them there, and, for the repose of their souls, have ten low requiem Masses said for each of them. 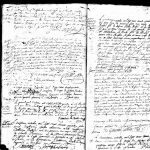 This contract was prepared by notary Arnould-Baltazar Pollet, and signed in the Joubin home. The document was filed and registered by the “Prévost” of Quebec, on June 10th, 1735, and signed by the registrar of the lieutenant general of the “Prévosté”. 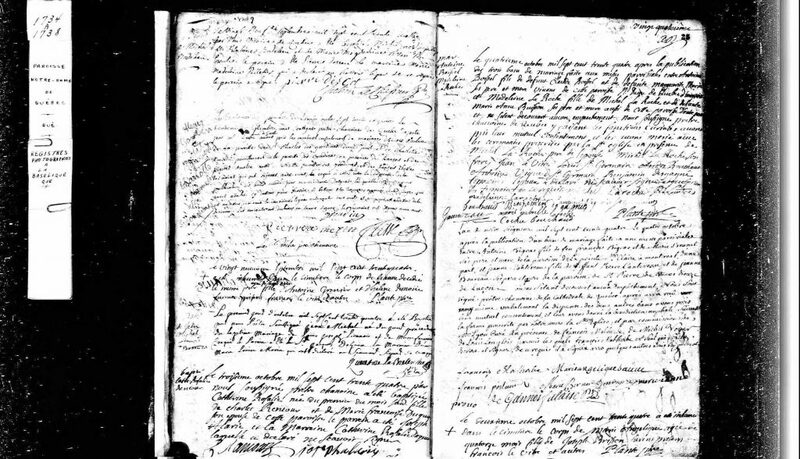 On April 14th, 1738, at the request of Françoise Renaud, his widow and tutor of their son Charles, who was then about twenty-two years old, an inventory and description was made of all their furniture, utensils, clothing, linens, livestock, coin and notes, letters, deeds, papers, information and all other effects of Jean Joubin. 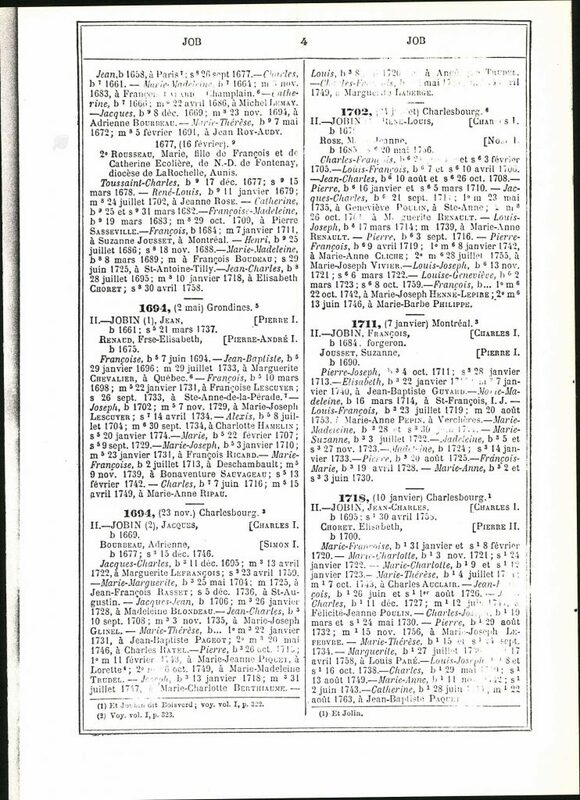 From this inventory, it is apparent that the Joubin family did not live in luxury. Their home had two rooms, one being the parents’ bedroom, with an attic upstairs for storing items needed in winter. No other mattresses were listed; when the children were young, they must have slept on the floor on mattresses which could be stored during the day. The livestock were probably the family’s source of cash for living expenses. At the first meeting, it was recorded that, among those present were: Charles Joubin, the minor son; Françoise Lecuyer, the widow of François Joubin, a resident of Sainte-Anne-de-la-Perade and guardian of a minor child; assisted by Jacques Renaud, acting in the interests of the minor daughter of Pierre Limousin dit Beaufort, the second husband of Josephte Lecuyer, the widow of Joseph Jobin and guardian of three minor children. Since Alexis had already been given two arpents, there were only two arpents remaining of their parents’ four-arpent property. It was agreed that one arpent would go to the widow, with the heirs sharing the remaining arpent. This decision was recorded, and another contract on the same date stipulated that the widow for the relief of her conscience after her death, and to settle any arguments that might arise among her children, has said and declared that because of her wish to remain with her son Alexis as long as he wishes her to do so, as she has in the past. Therefore, as a sign of her warm feelings for her sons Charles and François Joubin, for her son-in-law François Ricard, for her daughter-in-law, Françoise Lecuyer, and for Pierre Limousin, also her son-in-law, does surrender to them all her furniture on condition that after her death they will not make claims on the said Alexis Boisvert, to which the above mentioned children have agreed. Françoise-Elisabeth did her best to ensure that Alexis would not be bothered by the kind of quarrelling which so frequently occurs after a death in the family. Another contract was made between Alexis and his young brother Charles. Alexis and Charlotte Hamelin agreed to give Charles, when he reached his majority, a parcel of land three arpents by forty, including a small house. Charles accepted the offer and renounced all rights to the estate of his father Jean Joubin, except for the furniture which his mother had kindly offered him in the preceding contract. The next day, April 17th, the family members met to sign the legal documents, and Françoise gave the heirs the furniture that she had promised. Thus ends the story of a man who spent almost forty years of his life on his land in Grondines. Born June 5, 1694. There is no record of this girl. Monseigneur Tanguay mentions that she probably would have been deceased to the cradle. Born January 29, 1696 in Grondines. Godparents were John Trotier and Marie- Madeleine Aubert. He married Thérèse Chèné dit Lagrave. This is his first marriage, but the place and the date, are unknown. Nevertheless, we have the certainty of this marriage since their son Charles, marries Marre Agathe Arcand Deschambault, daughter of Joseph Arcand and Marie-Renée Chartier on August 7, 1752. On July 29 1733, Jean-Bapitiste marries a second time in Quebec city to Margurite Chevalier, daughter of Etienne Chevalier and Maguerite Lessard. On August 3, 1734, the register at Grondines confirms Jean-Bapitistes death and states his ages as “around 40 years”. Born March 4,1698 and baptized on March 10, 1998 in Grondines. At the age of 29 years, he marries Françoise Lecuyer, daughter of Antoine Lecuyer and Marguerite Gaillou. On January 18 1731, they went with the notary named Trotain in order to sign their marriage convention. As his brother Jean-Baptiste, François died young. On September 26 he dies at the age of 30. François, his spouse, will give birth some weeks later to a girl named Marie-Anne. Joseph and Marie- Josephte have, met the notary, Trotain, the day before their marriage to establish their convention. April 14 1734, while Marie- Josephte awaits their third child, Joseph dies. Josephs daughter, Marguerite was born the 28th of May 1734. He was 32 years at death. Marie-Josephte raised the three girls herself. She was born February 22 1707 in Grondines and died at the age of twenty-two in Grondines. Born January 3, 1710 at Grondines. 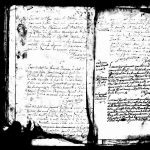 Alexis Joubin dit Boisvert and Charlotte Hamelin will be given all rights to land and buildings on the succession of Jean Joubin and the sum that they received of 340 Livres. She was born on May 8, 1713 at Grondines and baptized July 2, 1713 at Deschambault. On November 9, 1739, she marries Bonaventure Savageau, son of Alexis Savageau and Marguerite Martin of Grondines. Francoise dies very young. Funeral was on February 12, 1742. He was born on May 23,1716 and baptized the 7th of June in Sainte-Anne-de-le-Pérade.He marries Marie-Anne Ripau dit Rollet, daughter of Jacques Ripau and Marie-Françoise Delorme of Grondines, on April 15, 1749. 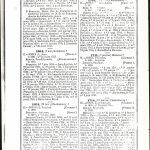 Alexis (our direct ancestor) was born July 8th, 1704 in Grondines. He was the son of Jean Joubin and Francois-Elisabeth Renaud of Grondines, Quebec.